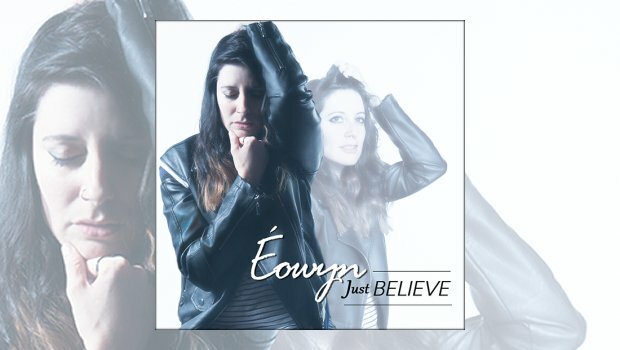 Just Believe is the sixth album from Éowyn, a Christian musician whose music is full of grace and words of faith that are meant to inspire. However, the album is also full of powerful music and words of hope no matter your religious preference; you don’t have to be a Christian to appreciate it, the lyrics are not heavy handed and it is music tailored to reach all those in need of some guidance or something inspirational to listen. The lyrics are meant to inspire a new generation to reach out for help from a spiritual world beyond their everyday struggles. Hero opens with cool keyboards, soft acoustic guitar and then Éowyn’s first vocals, as she sings “Come and be my hero” with little musical accompaniment until some drum and bell–like keyboards join in. This is a wonderful song, reaching out to the Lord for assistance with life’s trying everyday existence. The refrain is mesmerising and will stay with you long after the song ends, a well constructed and emotional song, written with Tom Bailey and Lucas Johnson. Drenched is the first single from the album, the video featuring Éowyn singing and semi-dancing. The power with which this song conveys its message is absolute; no matter who your God is, to have this kind of devotion is what Éowyn hopes for all of us. One of the best songs on the album. Who Says opens with keyboards, piano and organ, a waking from a dream moment before Éowyn sings, “You and I can stand the fire. Oh, I know you’ll help me. Only you can break my sense of frailty”. The refrains and lyrics are wonderful. The music supporting is keyboard driven, with softer drums. A modern Rocky–like anthem saluting help from above: “Let’s hush the naysayers, take on today like we can do anything!” I’m in! Believe is the best and strongest song on the album, opening in similar vein to Sylvan’s Midnight Sun, with Mimi Schell-like vocals which made it an early favourite. The piano on this track is even more powerfully striking. Éowyn sings her heart out on this song, you can feel the emotion of going through difficult times and seeing through to the better days with faith. Éowyn admits to doubts, proving that we all go through tough times and must hold on to our faith to get through. “My miracle is ahead!” – faith in something better, rather than nothing is the message that she hopes to send out. Safety is another powerful song of inspiration, Éowyn singing, “You say there’s so much more to life than this. I’ve missed so may things simply staying stagnant”. A request to break out of illness, depression or whatever has a hold of you and reach out for something beyond your control. Music the world needs when so many are in need. The keyboards, guitar, bass, and drums have a modern prog sound. Set Free features the accompanying vocals of Nikko Custodio and the duet is just what the album needed at this moment. Éowyn sings, “I’m free. I know now I’m set free!” She holds the last word so well. Custodio provides a great rap at the end to connect with Millennials. Powerful opens with deep keys and orchestration, Éowyn singing, “Who can comprehend the Earth’s expanse, its dimensions that you clearly set?” The melody and some of the lyrics reminds me so much of Sinead O’Connor’s Nothing Compares to You. On Worth Éowyn sings, “My worth doesn’t rest in their hands and it never hinged upon this world’s demands”. Such a powerful statement for everyone, no matter your religion. We all need hope beyond what we see and confront every day. This album was originally intended to be Éowyn’s acoustic album, and Crazy might have been one of those earlier tracks as it opens with an acoustic guitar. Fully Alive is full of keyboard orchestration which surround Éowyn as her voice echoes and reverberates throughout the soundscape. She sings, “Stop wasting time. Leave doubt beyond. Like clockwork move ahead!”, while the clicking of the keys, like a clock, type out their pace and wind sounds whip around her. Closer is another strong song of commitment, full of wonderful piano and impeccable vocals, and I Want You to Know is a song Éowyn wrote for her husband. She sings about their strong commitment to each other, the storms they have weathered and how they are stronger because of it. Every guy would love to hear their wife sing, “You are the prayer that came through”. Again, this is a wonderful album full of inspiration. For Éowyn it is her God and family, but anyone can interpret this album in their own way and celebrate whoever they draw consolation from and use the music and lyrics to help inspire them. Give this album a chance and enjoy it.